Puppies are just over 3 weeks of age! Is it time to get them out of the whelping box?? Yes, because now 2 have crawled out!! It is time to get them on wood chips and out of the box. They are eating soft food daily and are responding to my voice before I feed them. Annie is spending less time in the box and the pups are ready for more food. The grass is just beginning to start to green up and after this next system next week, we will get them to the lawn daily. We are excited for the next 3 weeks and then they will go to their new homes! Eli meets Annie REPEAT breeding. Pups due March 15, 2019. This breeding coming by request. Eli and Annie line up perfectly to bring together true classic, blocky Labrador looks, strong pointing, marking, retrieving, intelligence and quality family dogs. This loaded pedigree features several GMPR's and APLA Hall of Fame dogs and all 4 grandparents are 4X Grand Master Pointing Retrievers; 4x GMPR MHR Baier's Lady Legacy MH, 4XGMPR High Priest of Israel SH, 4XGMPR Beckmann's High Point Jazz and 4XGMPR Beckmann's High Point Stealth, GMRP Wannamaker's Hot Tub, GMPR Sauk River's Feather Storm Jake to name a few. Eli is an APLA Advanced Pointing Retriever. Eli is very muscular, lean and has a nice broad chest and square head. He weighs in at 78 pounds and has a ton of drive and is simple crazy about birds. Eli is a brush buster in the upland field and covers a ton of ground. He will go hard all day long and will go from quartering hard to stopping on a dime to point a bird. He has one of the strongest, most intense points you will find in a pointing lab. He simply loves the upland field! Eli is a great marker and has an incredible nose. He will locate birds in the toughest of conditions or cover. Eli is a family companion and is a joy to have in our small kennel. Annie is a good looking 60-65 pound yellow female who has earned her APLA Certified Pointer title. She comes from some incredible bloodlines and features both her parents as 4X Grand Master Pointers. Annie is the most versatile gundog I have ever seen. First and foremost, she is a companion and friend. Annie has a strong staunch point, is excellent at marking, and is very intelligent. She frequently retrieves down pheasants in standing corn that make any hunter marvel at how she marked the fall. Annie just loves to train and hunt. She has a love for retrieving and doing any obedience drills. She simply loves to please! Annie has a huge ON/OFF switch. She will go hard with much drive and desire with training and hunting, and then, turn it off and be a calm, family friend who will play but also lay around. Taking $250 deposits to hold you pup. 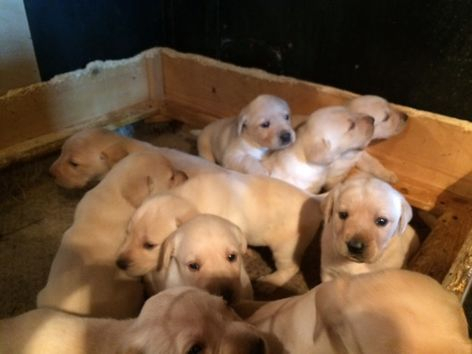 Pups will be going to their new homes mid May and will be EIC and CNM clear by parentage. Pups come with 28 month hip and eye guarantee and dew claws removed, shots, and wormed. Males $1000, Females $1250.